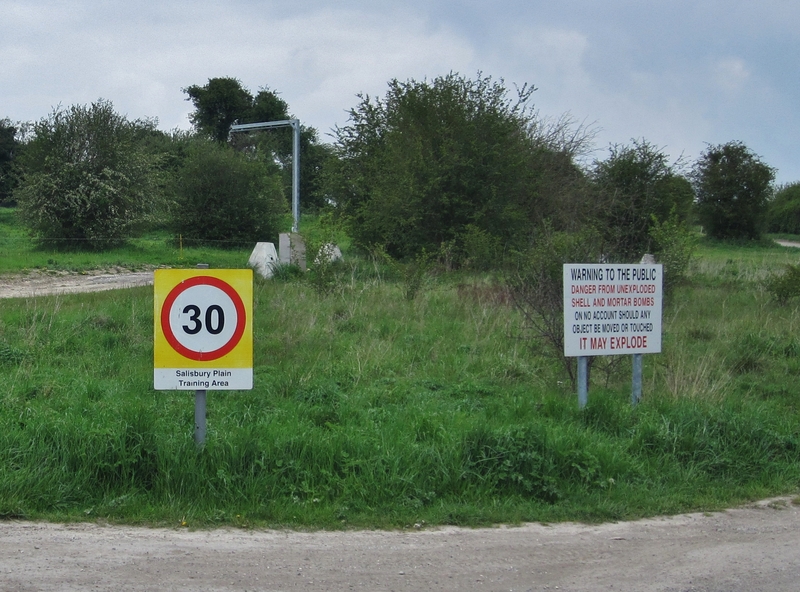 One of our must-sees was the Bulford Kiwi in Wiltshire, not far from Stonehenge. But try as I might, both online and locally, there was a lack of information about how to get to the kiwi. With the help of Google maps I came up with a plan of attack. Hopefully the information in this post will be useful to others also wanting to find the kiwi. 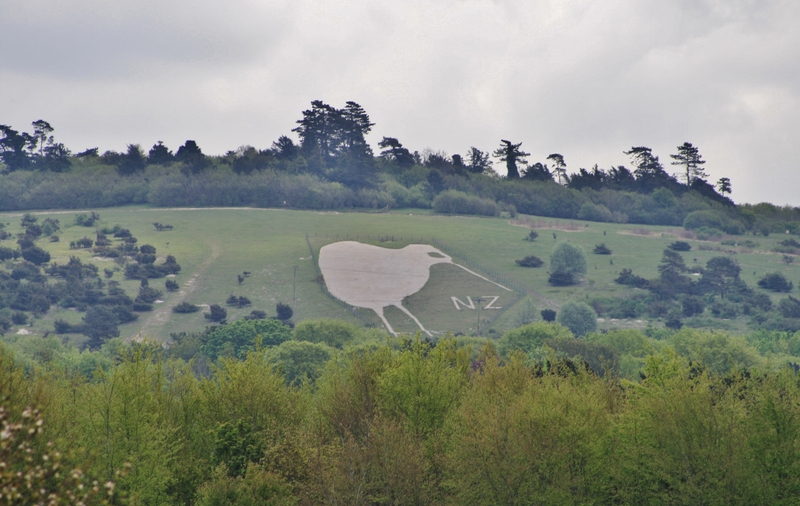 The Bulford Kiwi is a huge kiwi bird designed with white chalk into Beacon Hill above Bulford Military Camp. It was built in 1919 by New Zealand soldiers who were waiting to come home after the end of World War One. 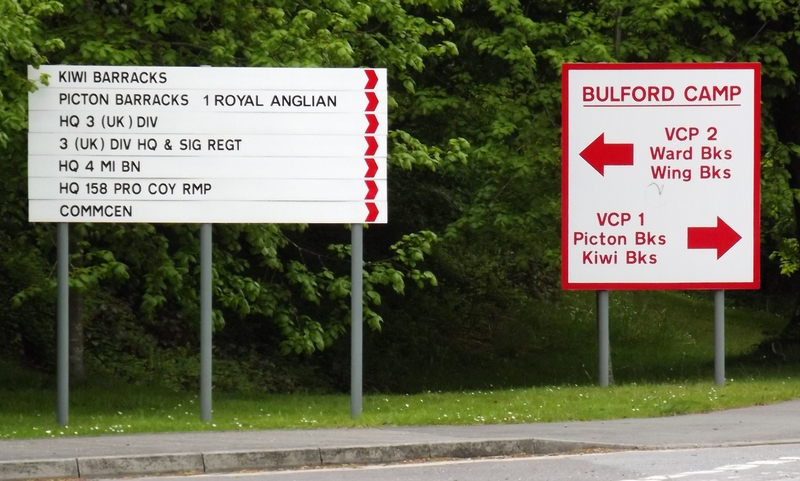 They were based in Sling Camp, an annex to Bulford Camp. While they awaited repatriation, the troops got restless – and a bit disorderly. The kiwi was devised as a project to occupy them constructively. Sling Camp was big, being home to over 4000 NZ troops. It was pulled down in the 1920s but the kiwi was left. This is a great photo of Sling Camp and kiwi back in the day. Interestingly, during World War Two the kiwi was disguised to avoid it being used as a navigation marker. 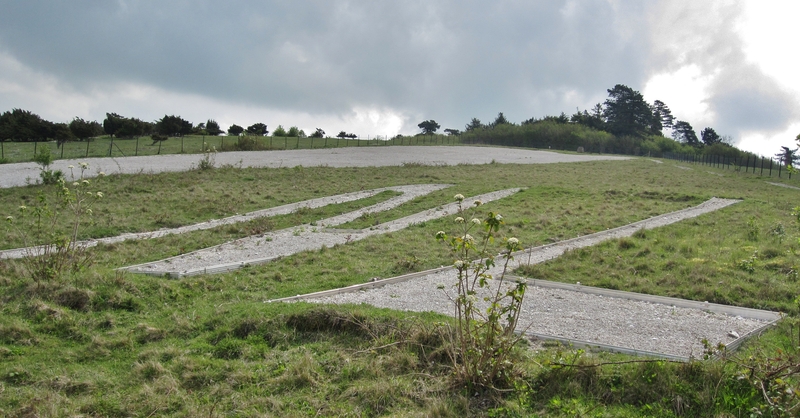 In the late 1940s a local scout group began a project to uncover the kiwi which actually resulted in them having to re-cut it out of the hill. How fantastic that they did this. For the last few years, the Ministry of Defence has taken responsibility for maintaining the kiwi. My genealogist mother first thought there had been a family connection with Sling Camp, but further research discounted this. Never mind, it didn’t diminish the desire to see this historical Kiwi landmark such a long way from home. The kiwi is visible on Google Maps satellite view – search for Gallipoli Rd in Bulford Camp; the kiwi is to the right and down a bit. 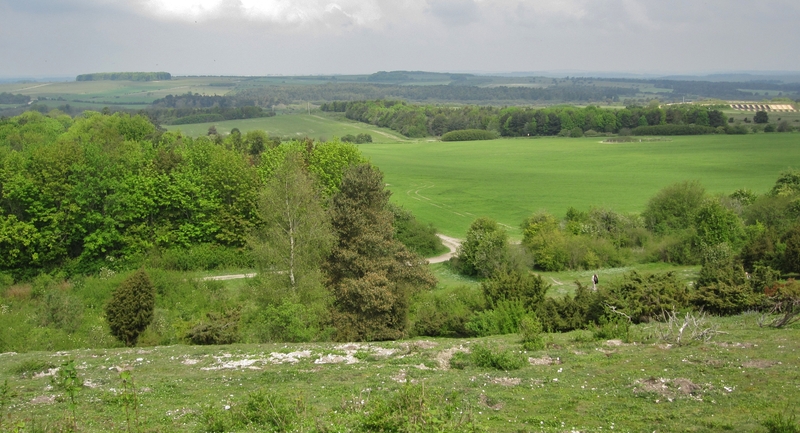 Bulford Camp is separate to but near the town of Bulford. Set your satnav for the intersection of Gaza Rd and The Crescent. 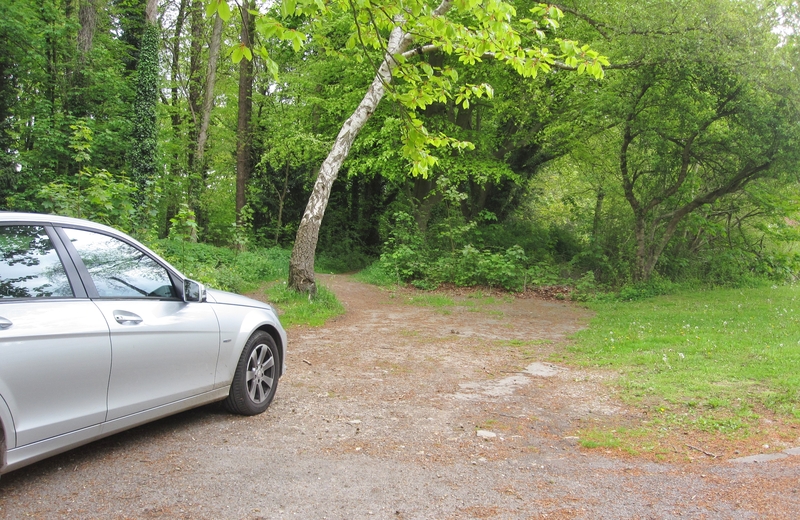 We found a parking space there just off the road. From that point Gaza Rd becomes a path through the woods, and to get to the kiwi it’s maybe a 15-20 minute walk. Note that some of the roads on the map are more like paths and cannot take vehicles, including half of Gaza Rd and all of Gallipoli Rd. I have since wondered if they date back to the days of Sling Camp and were no longer required when the camp was disestablished. We were unsure whether we could or should use the trail. But we had come too far and were prepared to take the risk. 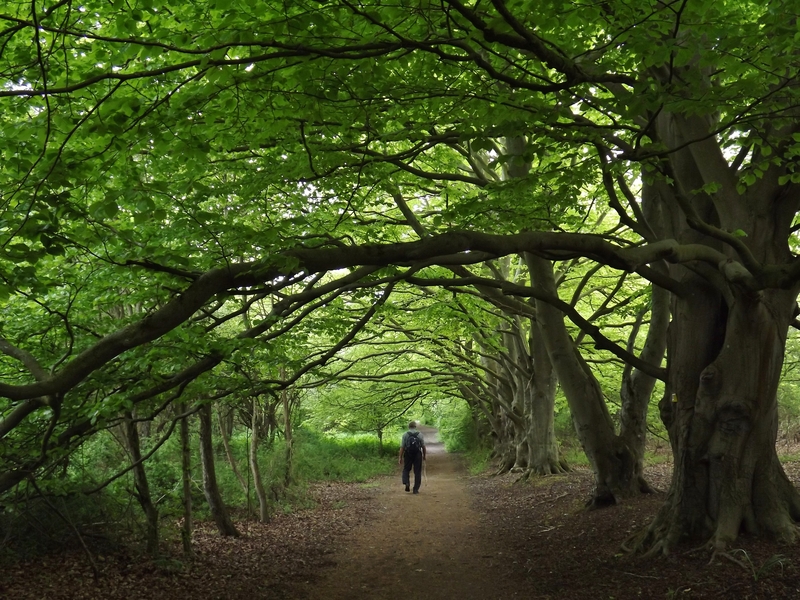 Later on when mum asked the person serving in the local post office, he said that unless there are signs expressly forbidding public entry, it is ok.
One of mum’s pics – dad on an especially nice section of path through the woods. You can either follow the woods path in a straight line and pop out at the base of Beacon Hill, or venture through an opening to the left. 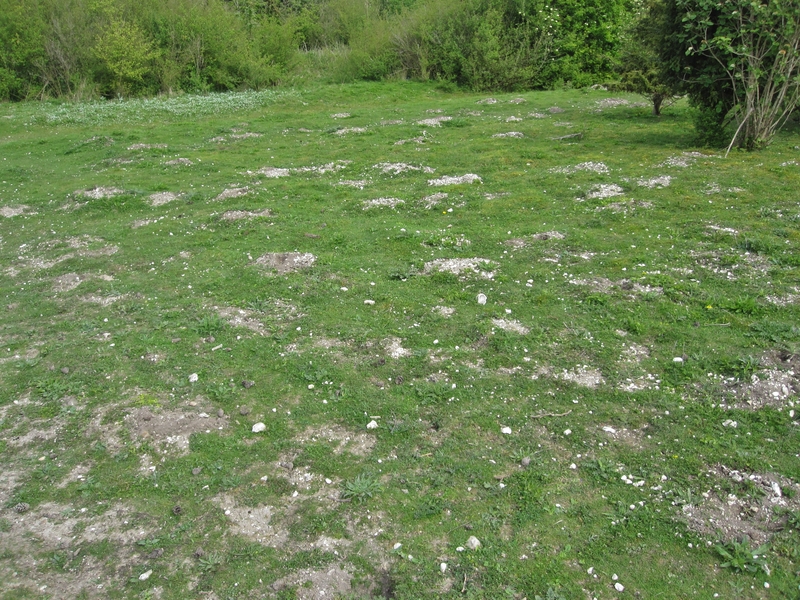 The hillside was littered with diggings – moles maybe? Once you start up the hill, veer over to the right and there, finally, should be the bottom of the kiwi. That was a pretty exciting moment. It was designed to be seen from a distance and at this proximity you simply cannot see it in its entirety. Further down this page are directions to a viewing spot further away. The kiwi is fenced off but you can get beyond the fence in a civilised manner when you get to the top. So happy to have succeeded! From up here I scanned the horizon for a road that could give us a good front-on view of the kiwi. With a bit of an idea in mind, we returned to the car back the way we came. Set the satnav for the corner (if possible) of Bulford Droveway and Sheepbridge Road. This is a little way out of town. Pull off into the large dirt layby area. 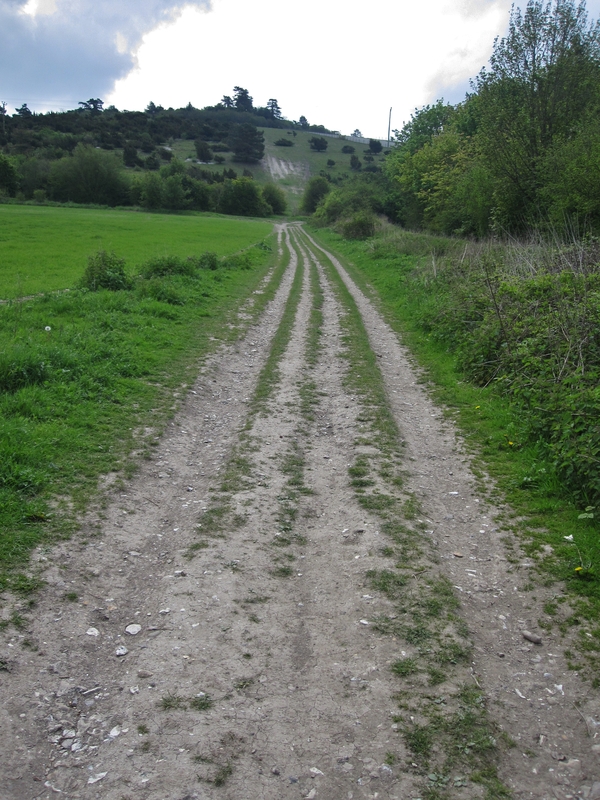 One of the dirt military roads leading off from here is almost straight ahead from Sheepbridge Rd, up a slight incline. Head up here; mind the ruts and holes! And up the rise on the flat, you can indeed see the kiwi. The end of a successful mission – I was very happy. Update March 2015: Adding a link to an excellent article this week about the kiwi’s history. Update June 2016: One of the commenters below has passed on the useful suggestion for anyone wanting to get up close with the kiwi who may have to contend with walking difficulties of parking just off Tidworth Rd past Firing Range 1, as the hill gradient from there is much more gentle. Thanks Mr Apperley! Update June 2017: The kiwi has now been given protected status and a book on the kiwi is coming out soon by Colleen Brown who has previously commented on this post. Update Feb 2018: Colleen’s book is due out in April. She has set up a Facebook group called ‘The Bulford Kiwi – The Kiwi We Left Behind‘ and would love for interested people to join! Update July 2017: There are now ‘official directions’ published on the fabulous Ngā Tapuwae Trails website, directing people to a track off Tidworth Rd. Good to know – thank you. I like the kiwi symbols on their website, and I hadn’t heard of those badges, unfortunately, as otherwise we would’ve tried to fit in a drive by. that was a really interesting link to the wiltshire kiwi! great directions. i’ve lived in wilts and only now heard about this kiwi!! I’m really pleased that this is useful to locals then as well as travelling Kiwis! Thanks for leaving the comment. Hayley your pictures (excellent) and directions were SO helpful. 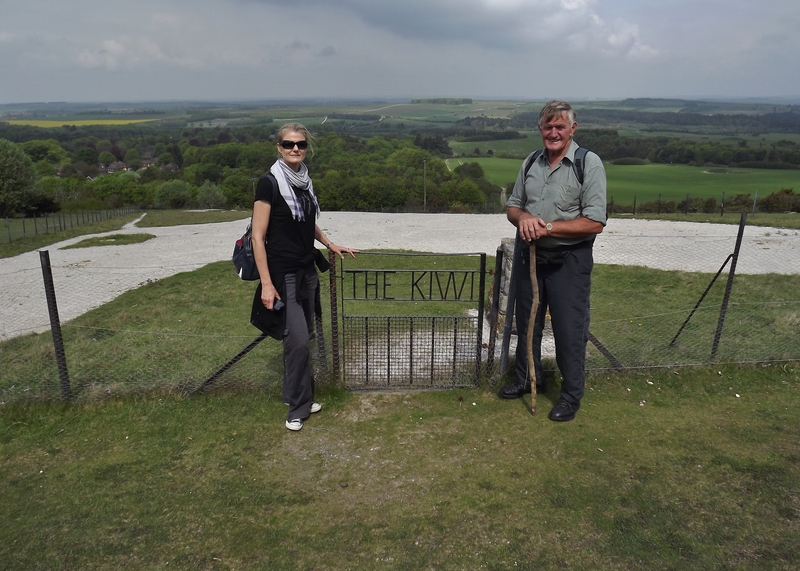 We (on a similar mission to you of experiencing the environs of someone who was in Sling Camp in 1917) also climbed up to the Kiwi and it was such a good thing to do. Not as good weather as you but got some shots when the rain abated. Thanks again! Penny. Thanks for the info on the viewling location – perfect. We had been to the actual Kiwi previously for a picnic, but had trouble finding a good viewing location. Took a fellow NZ’er there on our 110km ANZAC day ride yesterday, he loved it. Rapt to hear that! Great idea for an Anzac outing. Thanks for coming back to leave a comment. Excellent, nothing beats first-hand photos and coverage of the events. What a wonderful, whimsical thing! Thanks for posting about this site! Hi Darren, thank you. I’m really glad to have visited the Bulford area and been able to find the kiwi. Such a great piece of history to have on your doorstep. 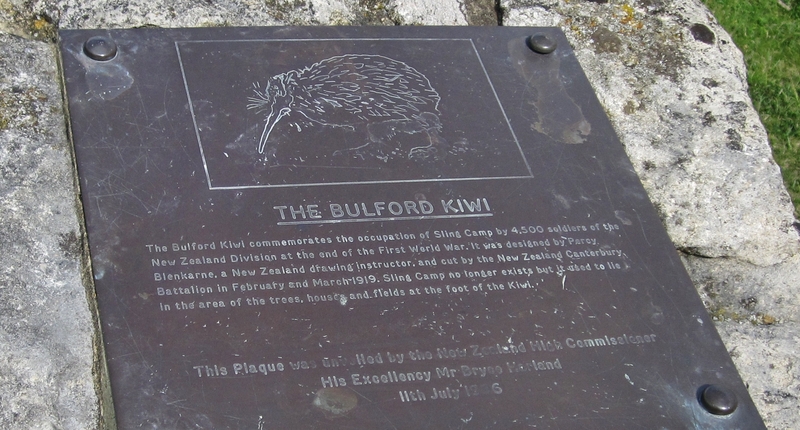 Hi Hayley, I’m so glad I found your blog post about the Bulford Kiwi! I’ve been living on the south coast of England, one and a half hours drive away from the Kiwi for the past 23 years and I didn’t even know it existed! My husband Stuart (a Brit) and I went to see it yesterday following your fantastic directions and photos. It was a great day and I even got a little emotional! I put some photos on facebook and they’ve created quite a bit of interest. I also told a fellow Kiwi who lives around here and showed him my photos and gave him the link to this blog post. I’m sure he’ll make it there sometime soon too. Here’s the link to my photo album if you’re interested, they’re pretty similar to yours though! Such a shame there isn’t a better place to view it from. That’s fantastic! I’m very happy you found the information useful. It’s pretty hard case that you live reasonably close by! Thanks so much for returning here to leave the comment. Awesome post. Love the pics and directions. Hi Anne, that sounds like a fantastic trip, you will enjoy connecting with those important places in your family history. Thanks very much for leaving a comment. I hope you find the kiwi without any problems – if once you’ve been there you think of a way to improve these directions, let me know and I can update the page. Sling Camp (Bulford) kiwi: designed by my grandfather, Percy Cecil Blenkarne. He studied a kiwi displayed in a museum to get the correct dimensions. Cherished piece of family history. Hi Steve – how fantastic! As proud of him as you all must be, he would surely be pretty chuffed that it’s still going strong today. Hi Steve – I’m a NZ researcher doing some work on the Kiwi and about to visit the site. You must all be very proud of your grandfather’s work -it was quite a challenge. I’d like to talk to you more about your grandfather if possible. Hi Colleen – I have emailed Steve to pass on your message and contact details. All the best for your trip! Thanks so much for that information snippet! Really interesting. It looks like the Kiwi Trophy competition is still very much an annual event. Hi Danny – you may be interested in the comment below from Stephen Fielding! Hayley, have just read your article about finding “The Kiwi”. Great! We visited here back in 1977 on our OE. My Dad had worked on the kiwi’s toe when he was in Sling Camp waiting to get a ship back home.We are going back to the UK in October for the Rugby World Cup & plan to visit the Kiwi again on our way back to London from Wales. Thanks for all your directions to get there & for viewing point as is a long time ago since we were there. Hi Colleen, glad the book is coming along! Please come back and let me know when you’ve reached that publishing milestone. I have emailed Dot to pass along your comment and email address. Have you ever thought about re-posting this one? Hi GP – no I haven’t so thanks for the suggestion, will keep it in mind especially with it being the WWI centenary. Thank you for your excellent directions on how to see the Kiwi bird at Bulford. With those we were able to see the Kiwi beautifully from the military off- road you clearly identified. 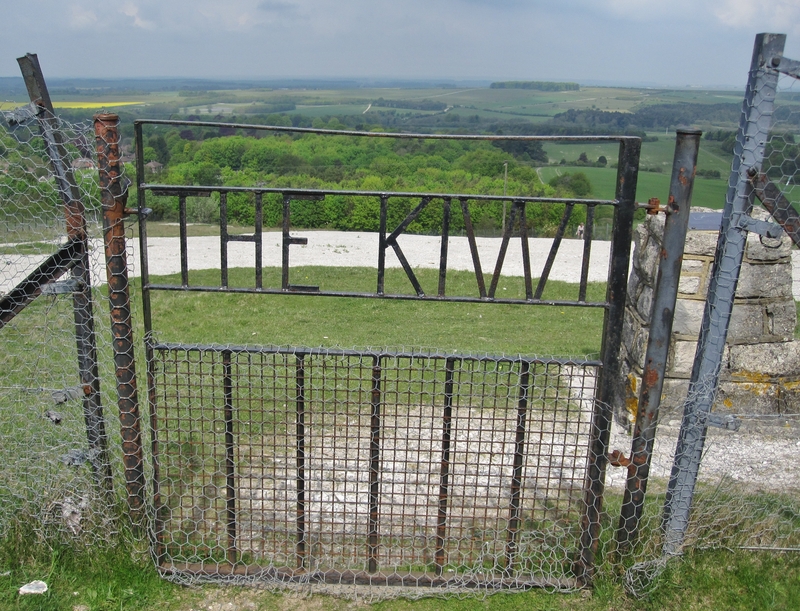 Whilst there, we met a local lady jogger who suggested we parked just off the Tidworth road past the Firing Range 1 to walk up to the Kiwi as it is a gently ramble and not too steep a hill, compared to the route you took through the woods. I only mention this for those with walking difficulties. Without your directions we would not have seen the Kiwi so well. That’s great feedback, thanks very much for taking the trouble to leave a comment. I’ve added the Tidworth Rd suggestion to the bottom of the post as I’m sure it will be helpful to others. I’m glad you had a good visit with the Kiwi! Hayley, Danny is being a tad on the modest side, in his account to you, while serving as the officer commanding of 249 signal squadron AMF(L) in the Army at Bulford around 1980 he rediscovered the Kiwi while out running on the hill, the story goes by falling into one of the legs, on his return to Bulford camp in looked into the history of the camp, to try and discover what he had fallen into because he had recognised it as man made and discovered the history of the Kiwi. He then set about trying to get it back to it’s former glory contacting the New Zealand high commissioner informing them of it’s sorry state, they thanked him saying they would look into restoring the Kiwi, sometime later they informed him the cost was prohibitive, Danny then contacted Kiwi boot polish asking for any aid they could give as the prefered provider of boot polish to the British Army, they responded with a very sorry no. To say that Danny is a very tenacious character is a bit of an understatement, we of the Squadron were due to go on exercise our vehicles travelling out by ship a week before us, he then called a squadron parade and informed us that we had 5 days to cut back the undergrowth of many years redefine the outline of the Kiwi and then re chalking it from the chalk pit beneath it. The weather was very warm and sunny and the work back breaking but we were spurred on by the promise of the Friday, Saturday and Sunday off if we completed it by Danny, on the Thursday Danny and the rest of the officers knew we would fall a bit short and contacted chalk provider, some 4 ton trucks were stripped down and sent to pick the chalk up and then driven onto the Kiwi to have their loads shovelled onto the kiwi, a bit of a shock set in then as it was noticed that this chalk had a pink tinge to it compared to the chalk pit at the base of the Kiwi’s pit, this was quickly made right by a very thin film of the Kiwis chalk pit being spread over the top of it. This is brilliant! 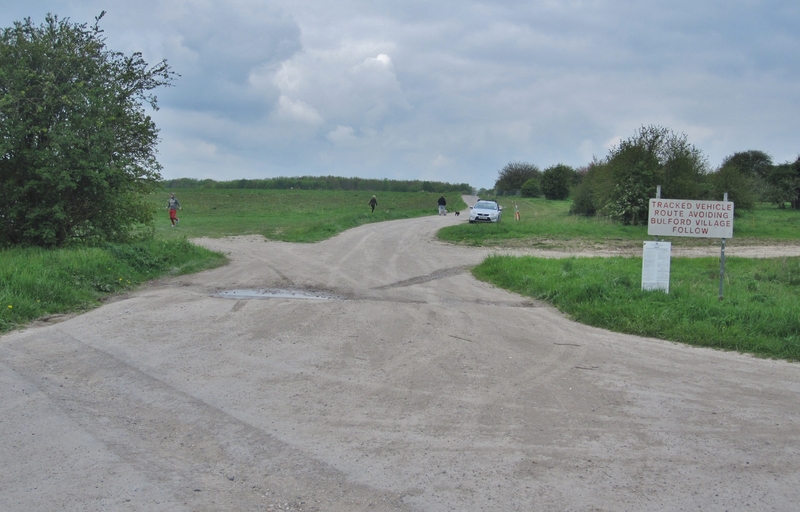 In June 2015 I parked halfway up the hill – turn in from firing range gate – and walked up to the track. We met some walkers (or is that amblers?) who took a pic of us at the cairn / plaque. My interest is directly in the camp and its life as too much is written about the conflicts as it is, and forgets about the life of the soldiers, transport, the passage, the accommodation between leaving home & departing for home. My grandfather was part of that system. Your description of visiting the Bulford kiwi is great! 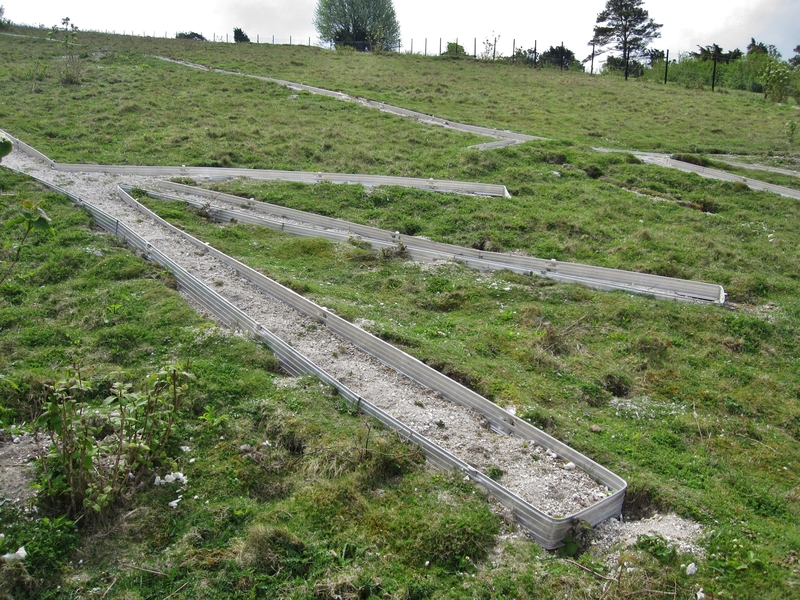 You and your readers might be interested in the Ngā Tapuwae First World War Trails which includes the kiwi as a stop and gives some history of Sling camp (https://ngatapuwae.govt.nz/sling-camp). 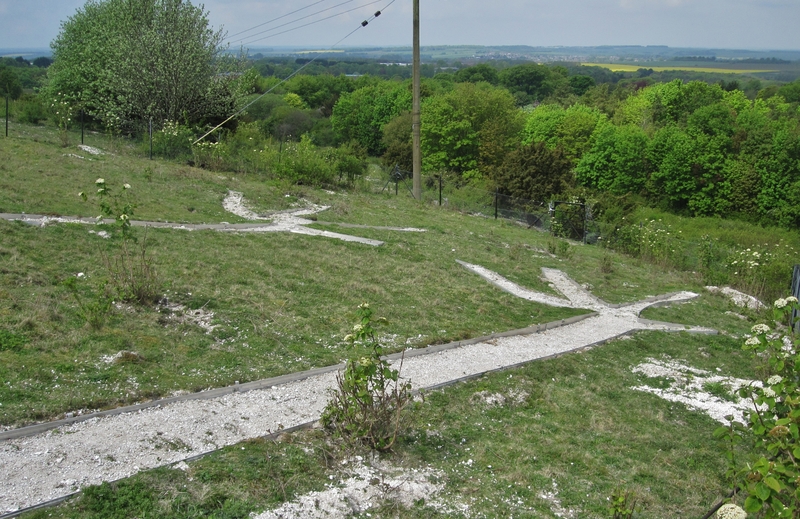 It also has directions on how to get there, going for the walk up from Tidworth Road. Thanks so much for that Denise, I’ve left a footnote on the post with a link to those alternative directions. Really happy to hear that!! Thanks for your great blog, i am originally from Nelson and was living in the UK for a long time, i stumbled across a mention of the kiwi while looking for chalk figure hikes in the area, i visited and was inspired to create the first listing in wikipedia back in 2007 to try and spread awareness of what i think is a really important part of NZs history. I will add your blog into the wikipedia page to help increase traffic. I have found some photos and postcards of the camp that really add to the backstory, and i am really looking forward to reading the book when it is published. Always good to connect with others who are interested in the kiwi which I agree is a unique and important part of our history. Your photo collection sounds great – that postcard (if that’s one you found) on the wiki page is fantastic and I think is appreciated more after visiting the site. Thanks very much for leaving your comment and adding the link! The book about the Bulford Kiwi will be out this April. Iâve created a FB page for it â called â The Bulford Kiwi. The Kiwi We Left Behind. It would be wonderful if you could encourage your blog followers to join up â and of course yourself. Hi Colleen, excellent – I’ve joined up and have added a note to the end of the post. Congratulations, I’m looking forward to the release!